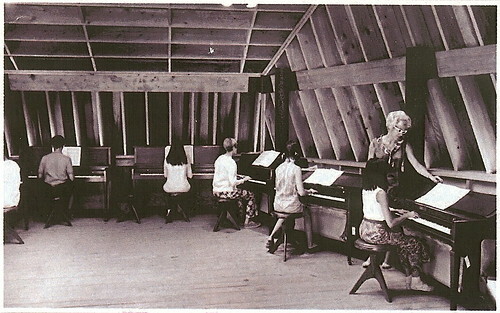 I received this flyer from Usdan which showed this vintage photo of one of the piano studios. I attended the Usdan Center for the Performing Arts (an artsy fartsy summer camp) in the summers when I was 8 to 12 years old (1975-1979), a bit after this photo was taken, but it still took me right back. These studios were beautiful hexagonal wooden structures shaped like teepees, with skylights and an open wall structure. The roof came down and overhung the wall at about 3 feet above the floor. There was also a small space between the short walls and the floor. You could lean against the wall and look out at the ground below and you could also hop down between the floor and the wall and escape to the outside (back then I was not so squeamish about spider webs). The first year I was there, the pianos were arranged against the far walls as shown in the picture, but in subsequent years, the pianos were arranged facing forward around the room, so you could hide behind the taller uprights in the back. I always took the back right corner. This also afforded the opportunity to "escape" in the middle of class much to our teacher's frustration. The one teacher I remember distinctly was the pianist Adolovni Acosta. She is a small feisty Filipino woman with long hair, heavy makeup and quite the temper. She wore beautiful long flowing dresses. She was also full of fun, and despite complaining about us badly behaved kids, she loved teaching us in this beautiful environment. I have to admit, I was probably one of the biggest troublemakers in the class, but also one of the better pianists. Basically the story of my childhood as a "talented troublemaker". I did a search of her on the internet and found that she is still performing today. I also found a quote which was typical of her personality, "Is it possible to remove my name from the web? Thank you. Adolovni Acosta." I guess it didn't occur to her that simply asking the question permanently put her on the web. I find it interesting how children remember their teachers. I like your blog about your Usdan piano teacher.